In Memoriam - Gisela Anna-Freier. 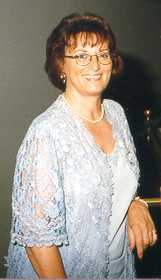 From 1996-2001 Gisela Schulz was president of the Friends of UNICA. On April 17, 1998 two frequent and active visitors and participants of UNICA married in Las Vegas: Gisela Schultz from Germany and Wolfgang Freier from Belgium. From then she became Gisela Anna-Freier. Sadly, after an ever more severely developing illness, Gisela Anna-Freier passed away on Tuesday March 6, 2001. The UNICA Committee wishes to express its sincere gratitude for all the work Gisela has done for the well-being of the club of Friends of UNICA. Our condolences go to her mother Hedwig Anna and her husband Wolfgang Freier, both very much engaged in the activities of UNICA.